In 1981 four lads from Liverpool (known locally as ‘The Fab Four’) got together with ambitions to ‘Shake the World’ ……..Ok, that didn’t quite happen but we did manage to become leg-ends in our own lunch-box! As well as publishing BREAKOUT; Breakout Productions ran entertainment and music evenings at The Left Bank Bistro in Mathew Street and famous music showcases at The Pyramid Club, The Venue and The Warehouse, Liverpool. We were at the centre of the early eighties music boom in Liverpool that spawned the likes of OMD, Teardrop Explodes, Dead Or Alive, A Flock of Seagulls, Frankie goes to Hollywood to name but a few. They were great times and I am proud to have been a part of it all and to have known such a great bunch of people. 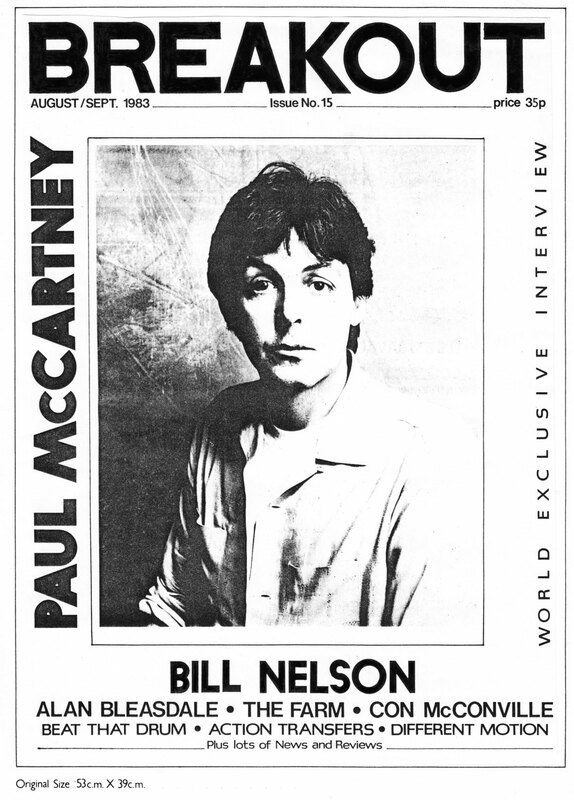 The following article is from issue 15 of BREAKOUT (Aug/Sept 1983)…..a world exclusive interview with Paul McCartney that hasn’t seen the light of day for 27 years!! I’ve presented it here and painstakingly retyped it under requests from users of The Mike McCartney on-line forum 🙂 and very happy I am to do so……..if you’re wondering about my involvement in BREAKOUT….I was responsible for all the design, layout and front covers that would put it head and shoulders above the rest…..it was all ‘cut ‘n paste’ in them days and all the lettering and graphics where hand drawn…..no computers then yer know 🙂 but in truth we all mucked in with the writing, photos and distribution….anything to promote local music and arts was great by us! And now it’s time for the main feature……….Enjoy! Air Studios, partly owned by George Martin, is situated in the middle of London’s Oxford Street, 50 yards from Oxford Circus Tube. It is on the fourth floor, high above the masses, where Paul McCartney is recording his new LP. It was in the rest room that we were to meet. The room looked more like an airport reception lounge, containing a coffee bar, pool table, video games and scores of exotic plants. So here I was waiting to meet Paul McCartney, a legend, who with the Beatles changed the face of modern music like no-one has ever done since. He entered wearing jeans, a short sleeved shirt, looking a little tired after recording. 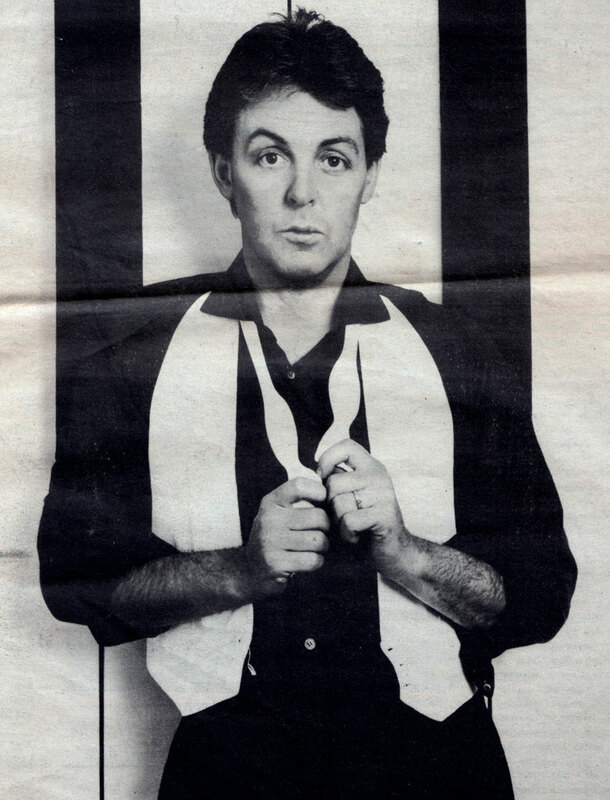 Paul McCartney has never been idle. As well as working on a new album he has recently been turning his hand to a spot of acting for a yet to be released film called “Give my regards to Broadstreet”. I asked him how the film was coming along. Great, we’ve just finished the main bit. We started in November last year and worked on and off till a couple of months ago. It was a big change for me. I did “A Hard Day’s Night” and “Help” and enjoyed the set-up of films. It’s like a fantasy world but a lot of hard work is involved. Do you intend to make more films? If this one works out. I think it’s working out. I feel good about it and didn’t even mind getting up early which traditionally musicians don’t like. It was great actually seeing the dawn again. I still prefer music though. Do you ever think your music will dry up? I always think about that from time to time. It’s like asking an athlete or a footballer about his sport and he’ll say he’ll go on till he stops enjoying it. It’s a cliché but it is true. I don’t actually think it will dry up. I always wonder if it will but I don’t think it will. I will probably be trying to write songs on my death-bed! Is it as much fun now as it was in ’64? No. It could be because it was a new thrill then. That’s why……..
……I like filming- because it’s a new experience. I’ve seen music come from 4 track to 48 track and more and it’s made it not as much fun. I don’t mean that it’s hell on wheels or lousy. I just mean that it’s not as much fun as four lads travelling down from Liverpool about to shake the world…..as they say up in Mathew Street! But you can’t possibly get that back. I don’t think you could recapture four lads coming down from Liverpool, seeing the music scene, having a bit of success then more success, and doing so well. I am now 41 and have four kids so it’s a whole different thing. It’s not so much of a novelty now as I know what I’m doing. It’s like the thrill of going to “Butlins” for the first time. It’s not as much fun going back there as the Entertainments Manager. I still love it. Yesterday I had a shout-up because the pace we work at is so slow. Before you can even get a 48 track tape up the engineer has to spend at least an hour to find out where he is. In the early days we only used to work with 4 track and we would record an album in a day. I think the record industry is over-produced, but it’s like looking back at old money and saying a pint used to cost three-pence. That’s the past. You can’t recall all that. The true answer is that it could not be as exciting as the first Beatle buzz because that had never been seen before. People of England didn’t know an English act could do that well in America ‘cos you know all our great English stars like Cliff and the people before him – the Frankie Vaughans and all those, and the comedians like Arthur Askey, and going right back – hardly any of them made it in America. They were always second best and for us to actually go and take over was something you can’t repeat, but I don’t want to give the impression I’m having a lousy time now – it’s just different. With 4 kids – with this whole other way of working – now it’s interesting on another level. A lot of people compare BREAKOUT with Merseybeat (Magazine). What do you remember of that? Well, we were there when Bill Harry started Merseybeat and for us it was just great to have anything, in truth, anything that was going to put our picture in it and mention us and actually we could put ads in it and have laughs so, for that Merseybeat, for us, was great and I’d say for the groups of today having something like BREAKOUT is great. BREAKOUT is more professional. Well actually the cover is, but inside isn’t. They didn’t look type-written like all the fanzines look now but I think it would be great. If I was just a young group in Liverpool, or not even a group – just a poet or anyone just vaguely sensitive , or however you class people who like these sort of things, I think it’s great having this kind of stuff. As for comparing it with Merseybeat it’s like comparing a brown shoe with a black sandal. There’s probably worlds of difference in your attitude really. We used to think it was kind of funny, Merseybeat, really, ‘cos it used to have articles like……”Take a look up North”…..’cos no-one looked up north and they used to tell us off for swearing on stage and drinking and eating cheese rolls on stage and you thought you know “What’s wrong with that. I mean we’re hungry you know and the fans don’t mind” – that’s what they’d come for – lunch-time sessions. So we used to have a coke on the piano. It was only coke. It wasn’t even booze but they used to say this was highly un-professional – chewing on stage! So it was a little bit ‘grandaddy’. We were kind of amused by it really. It wasn’t serious but actually that was one of my pleasanter memories. That is, that all the fanzines then weren’t serious – not like they are now. I pick up papers now and there’s this kind, you know, it’s like it’s all a bit like Rodin’s “The Thinker”. Like everyone’s thinking very deeply about it. We weren’t. We were just having a bit more fun and I don’t see music as that serious. I think it occasionally gets very serious with something like “Give Peace a Chance”, “Stopping Vietnam”. That’s bloody serious and good luck to it and if it gets serious – great! – but when you’re just singing something like “Flock of Seagulls” stuff it’s just songs. It’s just “I love you baby” really in a way. I think it’s just best to look at it for what it is instead of getting serious. I remember having a joke on this sax player once in Germany. My girl friend at the time sent me this “Yevtushenko” – the Russian poet, poems and it was all a bit heavy you know and we weren’t really into it. We used to pose a little bit with all that stuff, pipes on the top deck of the buses and think we were Dylan Thomas students and all that. So she sent me these “Yevtushenko” and we were sitting in the dressing room and this sax player came in and we didn’t really know him very well. He was from Hamburg so we were all kidding on we were really into this and I was going “….And the flesh that Creeps…..” I can’t remember the poem it was all dead serious. He tip-toed in and he thought we were like for real having a poetry reading and he thought we were like that. Anyway we were actually taking the piss so he crept in, he unpacked his sax very quietly and he crept out and we just peeped ourselves laughing ‘cos that was it. We were really sending up that attitude and I still prefer to send up that attitude although I realise that obviously at times you just can’t be flippant all the time but I think that to just be deadly serious about everything is dulling. There’s the famous case of some fella in America who had some terminal disease. He discovered that Vitamin C and a lot of laughter was the cure and he brought films into his bedroom – like Laurel and Hardy; and he got cured. I mean I don’t know how true it is but I tend to believe that sort of thing. A laugh is really good for you – and I think that some papers these days get a little bit serious. What do you think of the re-development of the Cavern site? Rubbish…. They should never have pulled it down. It was the most maniac move and the one man who did it – and it will have been one man too – that’s how these things all happen – one burk on the council, and I don’t know who he was, I mean it would be interesting to see what the vote was – 3 to 7 or something – just these three people, but somebody must have said….”it would be a great idea to have an underground railway coming this way – it doesn’t matter about the Cavern.” I think there was a bit of an attitude going round at the time which is easy to foster – which was “Well the Beatles left us. They hate Liverpool anyway”. Or, “They’ve deserted us”. We used to get an awful lot of that. I don’t care. If someone’s got to live somewhere else it doesn’t mean he hates Liverpool. Not for me anyway. There were millions of fellas before us who went to live in Shrewsbury or joined the army and went to Aldershot. We never used to go “Ooh he’s deserted us”. So I think a lot of the people at the time – maybe the council – were thinking “Well sod it – who needs the Cavern anyway” – and what’s happened is you get all these tourists turning up now saying “Where is it that the Beatles were”. So you get the Cavern Mecca people and stuff trying to keep a little bit of that going. I just think it was a stupid move to close it down. They could have easily kept it. They would have certainly used it for this Garden Festival. They could have stuck a big thing up and said “Come on” and charged 50p a go or something – like everywhere else in the world “Disneyland”. “Graceland’s” (Elvis’s place) Instead now they’re having to go round all our old houses and do that trick whereas it could have been much better to leave it all in Mathew Street and they could have had “Erics”. I don’t know – I don’t know all the interior politics of it all but it just seemed to me stupid and the final irony seemed to me that now they……. …….don’t need it. There’s a car park now wherever the underground was going to be. Now they’re trying to excavate it and it’ll cost them much more. Typical beaurocratic crap. You know – where they fill in a thing and now they’re excavating it – spending millions. Now they’ve found a pot hole in the Cavern and they’ve got a little boat in the water – so I’ve heard – and there’s a bank or some big building society putting money in and they’re going to recreate it downstairs. I think it’s stupid myself. I’d rather just see all of that stuff go. I mean I don’t want to down the Garden Festival ‘cos it’s happening and so it’s best to get behind it I suppose ‘cos otherwise it’s just a waste of money. But those things do annoy me you know ‘cos I just think surly you could spend the money better in somewhere like Liverpool where you’ve got so many people who need a break. Instead of all those statues they’ve put up I’d rather see them put up one little plaque…..”This is where they’re from”…or something. They could stick a plaque up on the Victoria one, that’s where we always used to be – you know up in the city centre. I’ve always said that you know, first they want to put statues up, then they don’t want to put them up. Then they don’t want the people to pay for it. I think it’s stupid. I think there’s much better things they could do, but, you have to have a “Touch of Class” and “Touch of Genius” to know all this see and they haven’t got it. Those councillors, whoever it was who filled the Cavern in – are just not bright – just not smart. I tell you, since we came down from Liverpool and seen all this business stuff going on I’ve met so many people in high places who are not smart – it’s terrifying actually – Prime Ministers and stuff. They’re not how you think they are you know. Well maybe people nowadays know – I think they know better now. We used to have a image that the President of America was a wonderful man. That was at the time of JFK and stuff. There was a little bit more reason, and then Nixon comes in and blows the whole thing sky-high and no-one can believe Reagan. They’ll have Frankie Avalon on next. You just can’t believe it any more. There has been some talk recently about you and Ringo playing together in the Summer. Is there any truth in that? No – that’s just paper talk. I read that just the other day. It’s not true. I suppose it could happen but we haven’t thought about it. The newspapers just made it up. Knowing now what you know about your life would you wish to have changed anything? Generally no, but yes in specific things. If I had known John was going to die I would not have been as stand-offish as I was. You know how people are in relationships. If someone tells you to piss off you say well piss off yourself then. You don’t realise that there may be pain and it’s very hard to say Jesus’s thing. You know – turning the other cheek. “OK, you can tell me to piss off but I still think you’re great”. If I knew John was going to die I would have made a lot more effort to try and get behind his mask and try and get a better relationship with him. As it was I think I did have a pretty good relationship with him but when he started slagging me off I was……. ……not prepared to say “well you’re quite right” because I’m human. Nobody would sit there and be called Engelbert Humperdinck and say “Oh fine. I think you’re right”. I just turned round and said piss off. Had I known it was going to be that final – that quick – I would not have said that. It was only after John had got killed that I realised at the age of three his dad had left him but I never knew how much it must have hurt. You take things on their face value and sympathise, but you don’t really get into it. John’s life was tough in one way. He was not the big “Working-Class Hero” he liked to make out to be. He was the least working class of the Beatles actually. He was the poshest because his family almost owned Woolton at one time. All that doesn’t really matter but he did have a rather tough up-bringing. His Mum used to live with a fella he was not that wild on and his mum got knocked down outside his house, and before that his Uncle died. He had a lot of personal tragedies and then he got married and that ended in divorce and he did not know how to relate to his son a lot. So after he died I could see and say “No wonder we used to argue”. When you live and relate to people day after day you don’t look into all of that until something as final as death happens. That’s my regret really where I now see what I could have said, listen and put my arm round him. He might have told me to piss off as well. It still goes on that’s the terrifying thing. George and I had a barney last time we talked. It’s incredible after all we have gone through together. It’s madness really. I find it weird – but that’s life. All the other stuff, what we did musically and the fame bit I don’t regret. It has its advantages and its disadvantages. Do you get a chance to listen to much music nowadays? Yeah. I listen to the radio mainly. I hear bits and pieces in the studio. I hear a lot through my kids as well. Really I’ve only heard Seagulls, and The Bunnymen. I think they’re alright. The Seagulls seem very commercial. The Bunnymen seem not commercial but have more integrity until he took his shirt off on Top of the Pops. I thought “Oh dear me, come on”. It just seemed silly. There’s nothing wrong with taking your shirt off on Top of the Pops actually but it just seemed a bit posey. I liked The Cutter anyway. I think their stuff’s good – interesting. The Bunnymen are like we were just getting on. It’s a very exciting period. I like the freshness and you can tell there is an enthusiasm. Would you prefer to visit Liverpool more regularly if you had the chance? I do have the chance and I do visit but I don’t visit as regularly as I used to because my Dad is not alive. I still go up to see my brother and other relatives. I’m up at least once a year – usually a lot more than that. As a city there is not a lot there for me anymore. Last time I was there I met up with an actor friend, Victor Bernetti. We were going out for a drink. We were driving around Dingle. I was showing him where Ringo lived and where my mother used to work and then we got on to the brow and zap it had all gone. This old fella in a wheelchair said a quote which summed it all up. He said “Oh yeah, they’ve pulled it all down and they’re not putting anything back up in its place”. And at this point we finished the interview. On a point which proves Paul McCartney still cares about his native city. And he knows his native city still cares about him. 19 May	This entry was published on May 19, 2010 at 9:55 pm. 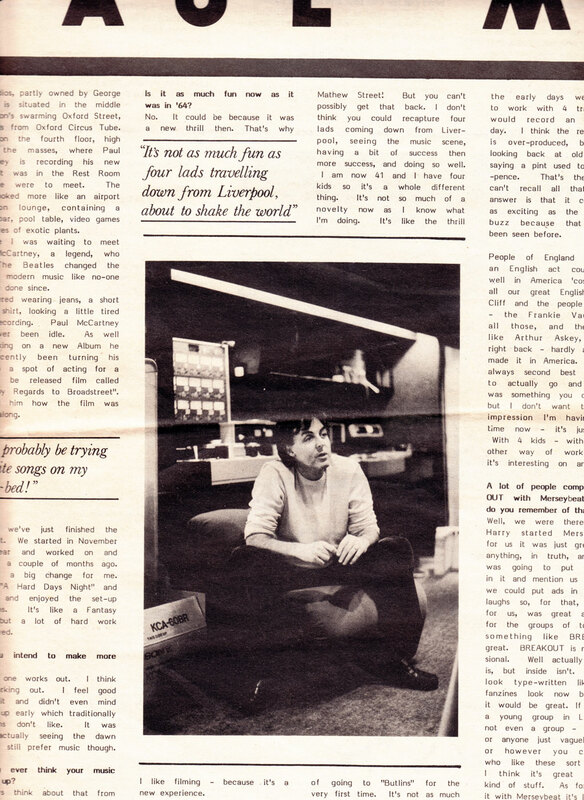 It’s filed under arts, culture, liverpool, music, writing and tagged 1983, and, arts, august, battle, beatles, breakout, exclusive, fanzine, george, harrison, history, interview, john, lennon, linda, liverpool, mcgear, merseyside, music, n, of, paul.mccartney, philip, rare, ringo, rock, roll, scene, sept, starr, the, world. Bookmark the permalink. Follow any comments here with the RSS feed for this post. Older: Picked up our Liverpool Lou! Thanks for posting it Phil. I loved reading it. And it was nice to see a sample of the design and layout. Thank U Very Much, Phil. Thanks Eduardo…….glad you liked it!